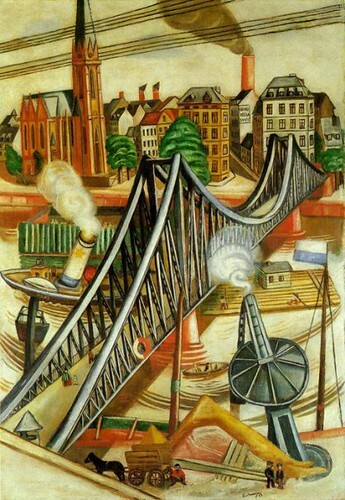 "The Iron Bridge (View of Frankfurt)"
The "Iron Footbridge" connected the center of Frankfurt to the Sachsenhausen district, where Beckmann lived between 1915 and 1933. Large Bridge reproduces, incompletely and in reverse, a painting of the same subject also created in 1922. This impression is from the single edition of about 50. View of Frankfurt puzzle in Bridges jigsaw puzzles on TheJigsawPuzzles.com. Play full screen, enjoy Puzzle of the Day and thousands more.